Mark Carney’s claim that Britain has escaped a “debt trap” common to Eurozone states has been dismissed by UK economist Michael Burke as “delusional.” Burke says Britain's debt has merely been transferred from private firms to UK homeowners. 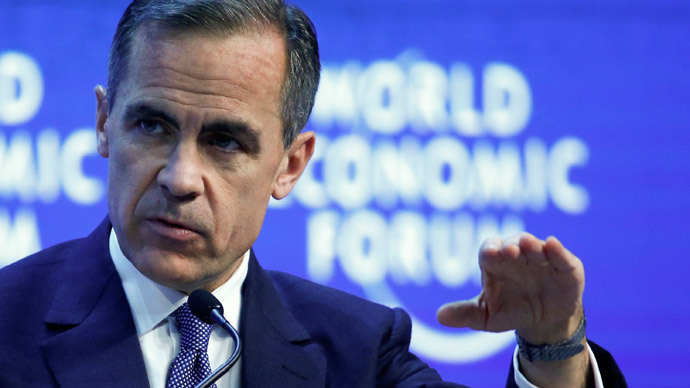 Speaking at a conference in Dublin on Wednesday, Mark Carney, Governor of the Bank of England (BoE), said all major advanced economies have experienced a debt trap since the 2008 financial crisis. He suggested states’ debt burdens had been exacerbated by low levels of growth and the private sector’s tendency to cut spending in difficult economic times. Carney contrasted the economic outlook of Eurozone states with that of Britain. He said that while certain Eurozone states are “sinking deeper” into debt, Britain has escaped this vicious cycle. The governor claimed that this great escape resulted from a specific set of economic and fiscal policies. He summarized these measures as: a fully integrated financial system that directs savings toward investment; more flexible fiscal policies than those common to Eurozone states; and the cultivation of a flexible and open economy. UK economist and anti-austerity campaigner Michael Burke rejected Carney’s claim that Britain had escaped its debt trap. The former Citibank economist said Britons remain deep in debt, and that people are borrowing more than ever. “Mark Carney is delusional if he thinks Britain and the US have found a way out of the debt trap,” Burke told RT. Speaking in Dublin, Carney sharply criticized austerity policies common to the Eurozone states, warning the single-currency area was constrained by strangulating levels of debt that could plunge it into years of stagnation. Carney argued the Eurozone needs to soften its budgetary policies and follow a swift path toward fiscal integration. He said a fiscal union would aid in the transfer of resources from wealthy to poorer nations. “Banks who recklessly lent have been bailed out, while taxpayers in crisis countries have been loaded with even more debt,” he said. Burke argued that the debt burdens of struggling EU states such as Greece and Ireland are unsustainable, and must be largely written off if real growth is to occur in these nations. His comments follow the newly elected Greek government’s challenge to austerity diktats peddled by EU policymakers. In the wake of leftist party Syriza’s election victory on Sunday, Greece’s new prime minister, Alexis Tsipras, appointed Marxist economist Yanis Varoufakis to the position of finance minister. Central to Varoufakis’ pre-electoral mandate was a pledge to address Greece’s austerity-fueled human rights crisis, a vow to reduce the nations’ debt burden by a minimum of €320 billion, and a pledge to tackle corruption and the country’s oligarchic elites. As Greece prepares to collide with Eurocrats over its plans to reverse draconian austerity policies and renegotiate the country’s debt burden, citizens in other heavily indebted states such as Ireland, Spain and Italy will be watching closely. Earlier this month, IMF chief Christine Lagarde called the Irish people “heroes” during a visit to Dublin. Her assessment related to Ireland’s supposed economic recovery, following a grueling four-year IMF/EU bailout. Her comment angered Irish MPs and anti-austerity campaigners alike, who argue Ireland remains deep in crisis. Colossal levels of socialized bank debt and relentless austerity have crippled the country’s economy and shredded its social fabric, they warn. Since austerity was implemented in Ireland, the proportion of people in persistent poverty has soared by roughly 100 percent, according to Irish think tank Social Justice Ireland. Burke, who backs UK campaign group the People’s Assembly Against Austerity, says austerity has also failed Britain. He said Britain’s economic model has failed to create a stronger and more stable economy. “In Britain and the US, austerity has been combined with policies to boost consumption,” he said. Burke concluded that British consumers are borrowing more than ever, the British government is “also borrowing more from abroad,” and that these inflated “bubbles of borrowing” are destined to burst. He said Britain’s economic model should not be emulated by struggling Eurozone states.